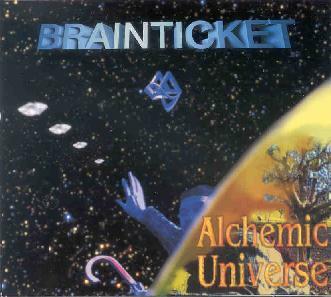 Though more international than the Krautrock bands that they were associated with, Brainticket was a pioneer of Kosmiche music along with Tangerine Dream, Klaus Schulze and the like. In recent years, keyboardist and head Brainticketer Joël Vandroogenbroeck has lived (I believe) at various times in Mexico and Florida, though still thankfully active in music with a decidedly kosmiche style. The CD opens with "Life's Mirror". After a floating intro segment the main theme kicks in, consisting of steadily pounding rhythms, dreamy keyboard melodies and bubbling liquid electronic effects. It's a great combination of mind-expanding symphonics and killer alien activity. Add in meditative narration from Carole Muriel (who crops up intermittently throughout the album) and outstanding sound and production and you've got an earphones experience that will propel you into the stratosphere. "Transformation Of A Stream" begins with an odd but interesting combination of jazz piano and spacey DJ beats and effects. But at about the 4 minute mark things become more Tangerine Dreamy with shades of symphonic rock, though the electro DJ beats are still responsible for the frenetic robot rhythms. And once again Joël demonstrates a captivating sense of composition, the melodies having that magical quality that classic progressive rock always had. "Relics N Roll" is similar, and possibly the most reminiscent of the prog/kosmiche days, stretching out into 12 minutes of brain massaging bliss. I was a bit surprised though when around the 8+ minute mark a jazzier theme was introduced which didn't really seem to jibe with the rest of the track. But this only lasts a moment and a darker pounding section raises the intensity level on which the piece closes. Joël does the same thing on "A Dreamer's Reflection", starting off completely cosmic but then introducing some really fluffy light jazz. And for some reason the last few minutes of the track are pretty much identical to "Life's Mirror". Somewhat different, and one of my favorites, is the title track, which takes a turn into avant-garde sound exploration, still completely in space, but making use of multiple aggressive and noisey electronic waves and patterns to paint a sonic collage like landscape. It also includes some of the freakiest brain twisting sounds on the album. But after about 5 minutes Joël eases the listener by bringing back the more accessible symphonics and melodies, though by no means abandoning the flurry of oddball sounds and effects that characterize the piece as a whole. Probably the most challenging track of the album, and I was pleased to hear similar investigation on "The Subspace Between". In summary, Brainticket do an excellent job of striking a balance between serenity, avant-garde experiments and alien fun. The music draws on Joël's past from the pioneering 70's, while by no means being content with mere retro recreations of that bygone era. It's the sounds you love, but with fresh life and ideas breathed into them. For more information you can visit the Brainticket web site at: http://www.brainticket-art.com. Visit the Fuenfundvierzig web site at http://www.fuenfundvierzig.com. Alchemic Universe is distributed by Swamp Room Records. You can visit their web site at: http://www.swamp-room.de.